Some years before, another Spanish Jesuit (and member of the so-called "School of Salamanca"), Juan de Salas, concluded in his Comentarii in secundum secundae D. Thomae et contractibus (Lyon, 1617) that the contributing factors to a given price are so complex that "only God, not man, can understand them exactly." In the theology of the scholastics at Salamanca, "just price" was thus tantamount to the market price, resulting naturally from interactions between buyers and sellers. Attempts at setting a "just price" to replace a natural market price, whether by civil or ecclesiastical authorities, were viewed with deep skepticism: weren't such attempts usurpations of God's knowledge? The answer to this query is simpler than it might appear at first. Almost twenty years ago, the world witnessed the end of an economic-political order based on the idea that the central planner, the avant-garde of the proletariat, or the political bureau — whatever the name of the director of the system — can replace the "chaos" of the market and improve upon the actions of millions of independent entrepreneurs, buyers, and sellers, who decide what is to be produced, in what amount, and at what price. This was found to be the case whether the good was steel, cement, or mere peppercorns. At the very foundations of the fall of communism, one can discover the exact "usurpation of God's knowledge" discussed by the Spanish theologians. In the great debate about the possibility of rational economic calculation in a socialist economy — a debate that took place in the first three decades of the 20th century — such economists and sociologists as Ludwig von Mises, Max Weber, Vilfredo Pareto, Enrico Barone, Boris Brutzkus and Friedrich Hayek clearly warned that the central planner, in abolishing private ownership of the means of production, abolishes at the same time the market for investment goods. In so doing, the meeting place of entrepreneurs and suppliers of capital is destroyed, and along with it the key source of price information — that is, information about the exchange relations between different capital goods. However, during this debate in the late 1930s — in the decade of the Great Depression — it was not the hand of Mises or Hayek that was raised in a sign of victory, but the hand of a Polish economist, Oscar Lange. Lange, together with Abe Lerner, argued that socialist managers would be able to simulate the process of price formation that one encounters in the private market. Lange was hailed by none other than Paul Samuelson, a future Nobel Laureate and the founder and guru of what would become the mainstream economics of the second half of the 20th century. Yet I ask: whose argument do we today recognize as victorious? It is certainly not Lange's. "OK, Mr. Strzelecki," you will ask, "but what does all of this history have to do with the crisis of 2008? What is the relationship between the present crisis of the neoliberal world economic order and the historical debate over economic calculation in a socialist economy?" The arguments of both schools of thought — the School of Salamanca on the one hand and the Austrian school of economics on the other — are powerful critiques against the central banks' role in regulating interest rates (the price of the product) and money supply (the quantity of the product). For the priests writing in Spain, to regulate the interest rate through a centralized authority would be to presume that one man could know that of which only God has certain knowledge. Looking at this issue from a different point of view — that is, one less connected with theology and more within the conventional vision of economics — we can ask the following question. Given that we think, as most of us seem to do, that the production of such goods as cars, vacuum cleaners, and frozen vegetables should take place in a regime of market competition, why do so many among us nevertheless agree that it makes sense to exclude the production of money from these same forces? Why must the production of money be entrusted to a monopoly called the central bank? The crisis of 2008 is not a "market failure" or a failure of doctrines of neoliberalism as such. Rather, and in a way that echoes the fall of communist economies two decades ago, it is the inevitable fruit of the hubris of central planning. In contrast to the communist economies of Eastern Europe, however, the hubris of the US central planner did not apply to the entire economy, but only to a portion of it: the production of money. From Roosevelt's confiscation of gold in 1933 to the closing of an international gold standard in 1971, the Federal Reserve chairman has increasingly been deprived of real market signals. In particular, he has been deprived of the important function provided by the right to demand redemption in gold for dollars, which serves as a key warning signal and imposes a great level of discipline on monetary policy. Thus, he is left to navigate between the Scylla of inflation on the one hand and Charybdis of recession (induced by monetary contraction) on the other — without any real indicators. Left in this dilemma, nothing other than inflation has resulted. In the period from 1913 to 2007, the Fed — implementing its mission to "stabilize the price level" — destroyed over 97 percent of the purchasing power of the dollar. (For comparison's sake, note that the value of the dollar had increased slightly during the 100 years before the Fed was created.) The beauty of fiat money! Hence, the need for theology. The destruction of 97 percent of greenback purchasing power cannot but be considered Satan's work. At least on this point, everyone can certainly agree! Translated from an article originally published in the Polish weekly Gazeta Bankowa, May 2009. 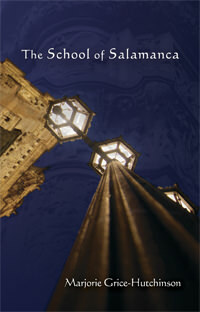 The Mises Institute will be traveling to the School of Salamanca for this year's Supporters Summit. Join us! "Pretium justum mathematicum licet soli Deo notum." "Quas exacte comprehendere et ponderare Dei est non hominum." See Jesus Huerta de Soto, "Juan de Mariana: The influence of Spanish Scholastics." See also the works by Raymond de Roover and Murray Rothbard.